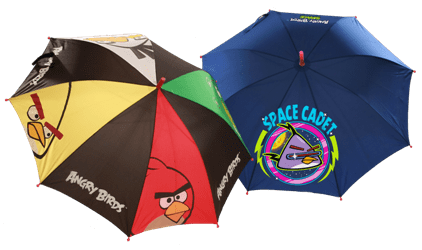 Bringing joy while battling the weather gods this monsoon season are spunky umbrellas that bear images of global cultural phenomenons such as Angry Birds, Madagascar, Shrek and more. Dream Theatre Pvt Ltd, a premier Indian licensing firm with rights to represent some of the most iconic brands in the world like Angry Birds, FIFA, Power Rangers Samurai, WWE among others, in association with their licensee Swadesh Essfil Pvt Ltd, now brings you branded umbrellas. Featuring the much loved Angry Birds, in their Classic and Space versions, the range finds a unique place at retail. Available at over 2,500 key retail and standalone stores besides leading e-commerce portals, the umbrellas cost upwards of Rs 425. With heavy showers lashing out across the country, the Angry Birds and Dreamworks umbrellas are surely going to make you walk down the lane with a happy refrain, singing in the rain. Dream Theatre is a brand management and licensing agency that creates and manages iconic brands in the kids & youth space in South Asia. Dream Theatre represents Warner Bros. Consumer Products for core portfolios of Promotional Licensing, Food and Beverages and Personal Care. In addition, for all licensing categories and portfolios, Dream Theatre represents Rovio for Angry Birds, DreamWorks Animation, Noddy, Skelanimals, World Wrestling Entertainment, Saban Brands for Power Rangers Samurai, Sanrio for Mr. Men Little Miss and the Discovery Enterprises portfolio for Animal Planet, Discovery Kids, Discovery Channel, Discovery Expedition, LA Ink, Miami Ink and American Chopper. Dream Theatre’s latest forays are with fashion brands like Von Dutch, sports brands like FIFA & Indian superhero Krrish.